“Dockworkers have power.” With that simple statement, Western Illinois University professor and In These Times contributor Peter Cole kicks off his compelling new history, Dockworker Power: Race and Activism in Durban and the San Francisco Bay Area (University of Illinois Press). The story of the west coast International Longshore and Warehouse Union (ILWU), its legendary founder Harry Bridges, and the 1934 San Francisco general strike he led is broadly familiar to Americans who enjoy romantic stories of derring do from the labor movement’s past. Less familiar may be the union’s struggle for anti-racist hiring and layoff policies on the docks, and its crucial allyship in various civil rights struggles. Cole pairs their history with that of black South African docker organizing that presaged the struggle against apartheid by decades, and created an early and durable institutional stronghold of black power in South Africa. The similarities between the two unions don’t end with the struggle for their black members’ civil rights. Half a world away, the unions also struggled to maintain job control in a system of casual employment, grappled with job-killing containerization and flexed their power at the choke points of the global economy to extend solidarity to workers’ freedom struggles around the world. Although rarely in direct communication with each other, especially during the Apartheid era, the unions had remarkably similar approaches to the issues that vexed them. Cole’s book is a valuable contribution to the relatively thin field of global union comparisons. By the nature of their work, dockworkers of all countries have long been more cosmopolitan than many comrades in their respective national labor movements. They are exposed to new ideas and far-away struggles. Cole’s book stresses how these two regional workers’ movements melded their organizing for a better paycheck with the struggle against racism in their broader societies and how—keenly aware of their leverage in the fast-moving global economy—they went on to exercise transnational solidarity at these ports of trade. One of the substantial victories of the 1934 Bay Area strike was the replacement of the shape-up system­—the informal hustle for day labor work—with a union-operated hiring hall that worked to racially integrate the workforce. African-Americans from southern states joined the ranks en masse during World War II and were welcomed into union membership. But the end of the war brought a serious reduction in work on the docks. Union leadership recognized that if membership ranks within the hiring hall were reduced on a “last in, first out” basis, the newer black longshoremen would disproportionately feel the effects of the layoffs—an action that would leave scars within the port workforce for generations. In an act of racial solidarity that stands out in the pre-civil-rights era, the Bay Area locals of the ILWU decided instead to share the lack of work. All existing members stayed in the union, and worked fewer shifts until business picked back up. As a racially integrated union with a large black membership, the ILWU naturally played a leading role in connecting the labor and civil rights movements. The Bay Area locals were key organizers of a local 1963 civil rights demonstration, in addition to organizing one of the farthest-traveling contingents to that year’s famous March on Washington. They formed the membership backbone of the local chapters of the NAACP and Urban League. They pressed successfully for fair employment and housing laws in Oakland, and the union used its pension fund to build racially-integrated cooperative housing in the rapidly gentrifying Fillmore neighborhood in San Francisco. As Cole notes, the exceptional role of the ILWU in many left-wing struggles is often glancingly mentioned in historical accounts of the postwar labor movement. This book is the first time all of these examples and more have been brought together in a comprehensive narrative. Durban dockers have enjoyed far less attention from American scholars. Their history of labor militancy dates back to the 1950s, although the apartheid state did not extend formal union recognition to industries that employed black workers until the 1980s. The union they formed—today called the South African Transport and Allied Workers Union (SATAWU)—made substantial gains in pensions, health and safety—and won for workers a guaranteed minimum wage regardless of the availability of work. It also affiliated with the Congress of South African Trade Unions (COSATU), a junior partner with the African National Congress (ANC) in both the successful final drive to end white minority rule and in the post-Apartheid government since 1994. Interestingly, the ILWU’s commitment to civil rights extended to international solidarity. As early as 1962, Bay Area longshoremen occasionally refused to unload South African cargo in protest of Apartheid. In 1984, union members refused to unload South African cargo off of an older non-containerized ship, the Nedlloyd Kimberly, which sat docked at San Francisco’s Pier 80 for 11 days. The protest attracted the attention of community activists who joined daily rallies outside the port and eventually brought the ongoing work anti-apartheid boycotts to Bay Area colleges and community groups. In more recent years, Bay Area longshoremen have refused to unload ships carrying Israeli cargo in 2010 and again in 2014, during periods of active military attacks against Palestinians. Durban dockers, too, have notably refused to unload ships under contract with Israeli corporations in protest of what they call—and they have some license to say this—“an apartheid regime.” And their solidarity activism doesn’t end there. In 2008, they prevented a bloodbath by turning away a Chinese shipment of armaments that the embattled president of neighboring Zimbabwe, Robert Mugabe, had ordered in a last-ditch effort to prop up his regime. Both dock workforces began their nonunion eras essentially as on-call temps. In addition to racially integrating the docks, the ILWU-operated hiring hall also freed workers from bribery and the blacklist and allowed them to keep the best part of casual employment—only showing up for work when they felt like it and needed the paycheck. The non-employee status of Durban dockers, on the other hand, was a source of union power and legal protection, and made de-casualization the employers’ strategy to reign in the power of the unions. The Apartheid system of labor relations basically exempted industries that employed black workers from statutory collective bargaining, while making strikes illegal. But if workers finish their shift with no promise or guarantee of more work the next day and—collectively and entirely coincidentally—don’t bother showing up in the morning to see if there’s more work available until the wages get better, is that legally-speaking an "illegal" strike? By defying white boss power in work stoppages, the Durban dockers became pioneers in the African freedom struggle. A 1954 Durban docker strike resulted in wage concessions, but also the termination and blacklisting of strike leaders. Other strikes followed, but the workers were careful to not elect any formal leadership. Cole argues that the dockers sparked a strike wave in other industries in the port city in 1973. Those Durban strikes are widely acknowledged as a turning point in the struggle against Apartheid. Another economic change that all the world’s dock workers had to contend with was containerization. The standardized containers—40 or 20 feet long—that transition neatly from train to truck to boat (and back again) have revolutionized world trade. Filled with anything from diapers to televisions to just about any cheap plastic thing slapped with a “Made in (fill in the blank)” label, they rocket products around the world in the global logistics supply chain. Amazon’s two-day shipping program would be largely impossible without them. Entire fleets of boats have been replaced to accommodate the containers. Harbors have been dredged, ports relocated and shorelines reshaped. Of course, they’re job killers. Machines do much of the heavy lifting that used to require full crews of workers. Containerization was imposed on Durban dockers in 1977, years before they gained formal collective bargaining rights. In the decade before container ships first appeared at the Durban docks, the workforce peaked at 3,500 workers. By the time automation was fully implemented in the mid-1980s only 1,200 workers remained. In the Bay Area, Harry Bridges had the unique combination of street cred, shop-floor power and battle fatigue to make an accommodation with the shipping magnates. Rather than engage in dubious battle to preserve back-breaking jobs that were rapidly becoming unnecessary, Bridges struck deals in 1960 and 1966 that guaranteed all existing longshoremen wages even if there was no work. The slimmer crews who would work with the machines to remote control the giant steel boxes on and off the boats were promised a greater share of the profits. When rank-and-filers felt that those financial gains did not make up for the loss of job control they had previously enjoyed, they went on strike over Bridges' objections during the winter of 1971 to 1972. Stung, the old Communist militant lent no personal support to the strike. Still, the organized workers who remained employed in the Bay Area and at the world’s ports enjoy a position of tremendous leverage within globalized capitalism. There is an understandable tendency among those of us who care deeply about restoring the power of unions to grasp for breakthrough strategies and inspiring flare-ups of worker militancy like the recent teachers strikes and digital newsroom organizing wins. In contrast, trade unionists who instead focus on port workers and truck drivers can seem hopelessly quaint and backwards-looking. Meanwhile, global capitalism is still at its root about making and selling products in the global marketplace. Workers who have a hand in how quickly those products move—if they move at all—retain the capacity for tremendous power. Another book that takes stock of the potential power of workers at strategic locations in the global supply chain is Choke Points (Pluto), a new collection of essays edited by Jake Alimahomed-Wilson and Immanuel Ness. Peter Cole is here as well documenting the Durban dock workers’ solidarity actions on behalf of other African struggles for freedom from colonialism. Elsewhere, Peter Olney, former organizing director of the ILWU, makes a characteristically masterful contribution on the evolving nature of the global economy and the west coast longshoremen’s role in it. He writes, “the future for powerful dockworkers lies in conceptualizing themselves as logistics workers.” By this he means extending longshore organizing and solidarity further inland to the warehouses and trucking companies that combine to form the central nervous system of so-called free trade. The threat of waging strikes that can roll from boat to truck to warehouse would be an obvious point of leverage. Sheheryar Kaoosji contributes a vital and educational post-mortem assessment of one such effort, the comprehensive campaign to organize the warehouse workers and truck drivers a decade ago in the twin ports of Los Angeles and Long Beach. Despite being “resourced with strategic researchers and experienced organizers, and supported by motivated community partners,” this signature effort of Change-to-Win faltered with the changing political winds in Washington and the rival labor federations and the inability to get workers in different parts of the logistics chain to see their own common cause. Some of the other essays in the volume are thick with academic jargon that make them less accessible to the layman. It’s regrettable, because if you can parse the language Choke Points is a blueprint for revolution. 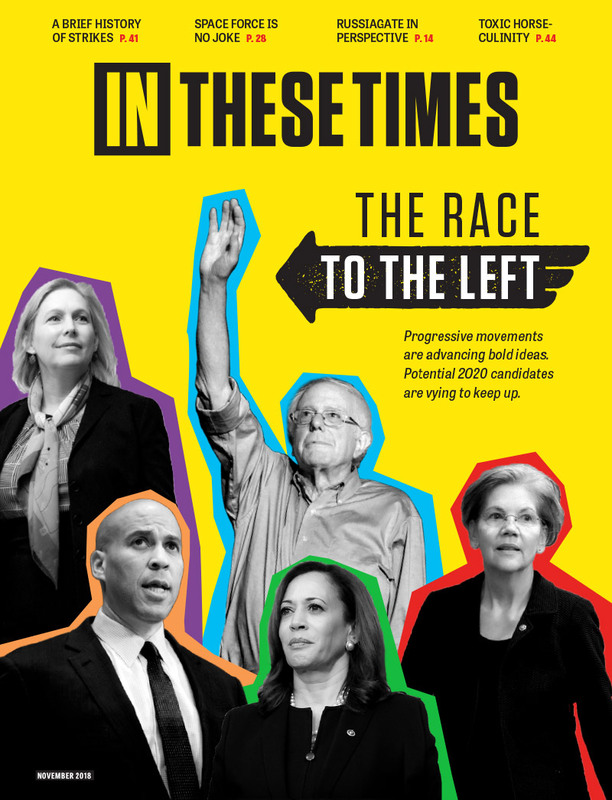 The best contribution both of these books could make is to help focus the new generation of young socialists who are eager to help rebuild the labor movement as rank-and-file organizers on where our power really lies. I mean no disrespect to the crucial work of journalists and teachers, but global capitalism can grind to a halt when the ships don’t sail on time.